Star Wars: Episode 9 Panel Announced for Tomorrow | Nerd Much? Well, happy frickin’ Friday to us! The official Star Wars Twitter account announced that there is now a Star Wars: Episode 9 panel scheduled for tomorrow. No other details were given, but fans across the galaxy are now hyped beyond measure. The immediate reaction across the internet is that we’ll finally get the official Star Wars: Episode 9 title. But we suppose it isn’t out of the realm of possibility that we could get the final Skywalker film’s first teaser trailer as well. For Star Wars: The Last Jedi, the film’s official title was announced on January 23rd, 2017. It then released on December 15, 2017. With Episode 9’s released slated for December 20th, we’re roughly 2 ½ months behind The Last Jedi’s timetable of Disney delivering the title. Which makes betting on a title coming tomorrow a solid proposition. More intriguing is that Disney dropped their first Star Wars: The Last Jedi teaser trailer on April 14, 2017. And with tomorrow being April 12th, we couldn’t really get any closer to lines lining up. It may just be a pretty safe bet at this point to assume that the Star Wars: Episode 9 title will be unveiled in the first Star Wars: Episode 9 trailer. The Star Wars: Episode 9 panel takes place tomorrow at Star Wars Celebration from McCormick Place in Chicago, Illinois. Other notable events throughout the long weekend include the already announced Star Wars Pinball, as well as the upcoming reveal of Star Wars Jedi: Fallen Order on Saturday. 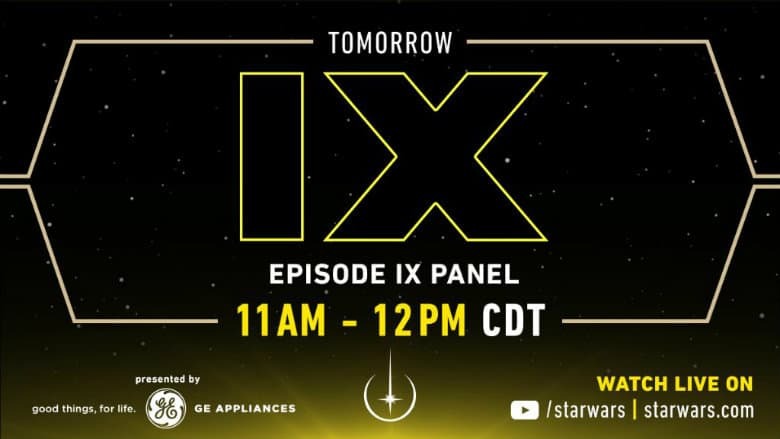 The Star Wars: Episode 9 panel will air live on both the Star Wars YouTube channel, as well as over at StarWars.com. We’ll break down all the relevant news as soon as it happens. But until then, read up on all the Star Wars movies headed our way after Episode 9 arrives in December.